Consider a claret glass; a transparent container whose spherical surfaces clumsily distort what we see through them. Fill it with water and instantly it becomes a lens in which we can see the world beyond turned upside down. It can even project a relatively focused image. Think also about conjoining manufactured lens and human eye; in the eyeglass or spectacle which is the earliest technology that led to the invention of this wonderful medium; photography, and all of its powerful enhancements of vision. Add to this the remarkable capacity of the human eye to focus by changing the thickness and curvature of its lens, and you have entered the mind of Professor Joshua Silver who by combining these phenomena has conceived of the world’s first universal self-adjustable eyeglasses. He pumps a high refraction, clear fluid (developed for the physicist by Corning) into the space between plastic membrane held in a spectacle frame to reproduce the eye’s remarkable focusing mechanism. Both longer focus and shorter are produced in this way. 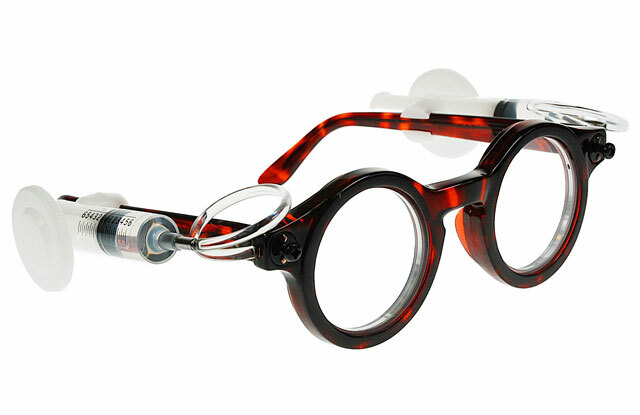 There have been numbers of designs for adjustable lenses. In the Polaroid Spectra a pair of wave-shaped lenses are overlapped eccentrically to alter their focus and zoom, and adjust for various aberrations. Their lateral adjustment and dimensions won’t fit into eyeglasses however. Mobile phone cameras apply electrostatic forces to alter the shape of their tiny liquid oil/water lens (Varioptic, Phillips, Sony), but that is too expensive to make for a device with larger lenses. Professor Silver’s discovery is revolutionary in being manufactured and fitted cheaply. Because they are self-fitting they require no specialist optometry. Through this remarkably simple device the full range of long-sighted and short-sighted people are given 20/20 vision; accommodated by up to +7.00 to −7.00 diopters (as yet the technology does not treat astigmatism, the distortion caused by a misshapen cornea). Furthermore, the fitting of the glasses is achieved by the wearer themselves. They separately adjust each lenses with syringes supplied fitted to the glasses, which are then removed. These attributes have enabled Adspecs to reach sufferers of poor vision in countries in Africa and Asia, with 30,000 of Silver’s lenses being distributed in15 countries. Vision problems are a significant handicap for learners. The Centre for Vision in the Developing World estimates that there are over 100 million young people (age 12-18) in the developing world who suffer from myopia, or nearsightedness. Of these, they believe that roughly 60 million (or 60%) lack access to the corrected vision that they need. These school-age children are the most urgent target for the Centre’s Child ViSion campaign. It provides self-adjustable glasses through school-based distribution programmes in the developing world. The initiative is a nominee for Designs of the Year 2013 at the Design Museum, London. Professor Silver is the director of the Centre for Vision in the Developing World at the University of Oxford. He is also the founder Adaptive Eyecare, which developed the original Adspecs in partnership with the UK Government’s Department for International Development, for distribution in developing countries. The affable Professor Joshua Silver is on TED Talks, demonstrating his invention of the world’s first universal self-adjustable eyeglasses, showing how simply a user can adjust their own Adspecs, or Adjustable Spectacles. DONG, L., AGARWAL, A.K., BEEBE, D.J. and JIANG, H., 2006. Adaptive liquid microlenses activated by stimuli-responsive hydrogels. Nature, 442(7102), pp. 551-554. Very interesting and enlightening James.